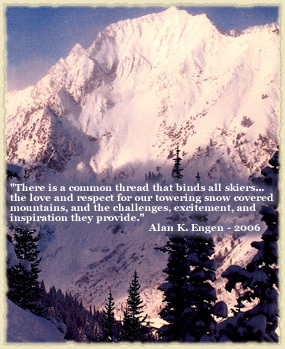 Alta Historical Society's 2018/2019 ski season will be celebrating Alta unique history and culture with our annual Fireside Side Chat program, regular presetations througout the season about Alta and the Wasatch Mountains. Come join us. The presentations are free and last about an hour. Keep an eye out for our posters at the guest lodges in Alta and at the day lodges on the mountian. You can also go to www.Alta.com and scroll down to the events section where the Fireside Chat for the week is also posted. The goal of the Alta Historical Society (AHS) is to preserve Alta’s rich history, from the mining era of the mid-1800s to the development of Alta as one of the world’s finest skiing destinations. (Mission Statement) Through our web site, we highlight past events, stories about notable characters, photographs, and a map of historical sites in Alta. The Alta Historical Society, Friends of Alta and ACE will host the Alta Gala 2019, a fund raiser for Alta’s three non-profit organizations at La Caille Restaurant at the mouth of Little Cottonwood Canyon Friday April 12th. Thanks to all the supporters and everyone who attended it has bee a great success for the past 12 years. You can learn more about the Alta Gala and buy your tickets by clicking here. Each year the Alta Gala selects an individual, or individuals, to give the Stellar Award in recognition for their contributions to Alta's environment, culture and history. This year we will honoring Margaret and Roger Bourke.